November is grey seal season! It is estimated that almost 50% of the world's population of grey seals live in UK waters. These funny little mammals spend a large amount of their time out at sea, but during the autumn breeding season they come ashore or 'haul out' onto rocky coastlines or outcroppings in large colonies. Seal pups usually start appearing anywhere between September and November, and are born with soft white fur rather than the greyish waterproof coats of adulthood. With their fluffy faces and huge dark eyes, seal pups are rather cute, and people often make special outings to try and catch a glimpse of them. Seal pups grow pretty quickly and after about a month they start loosing their baby fluff and begin to look a little more like adults. At this stage, with their new waterproof coats they'll take to the sea and you'll see them bobbing amongst the waves, learning how to fish with the adults. It is not too unusual to see grey seals around the coastline of the UK but they do often have preferred locations... as do those of us who go in search of them. 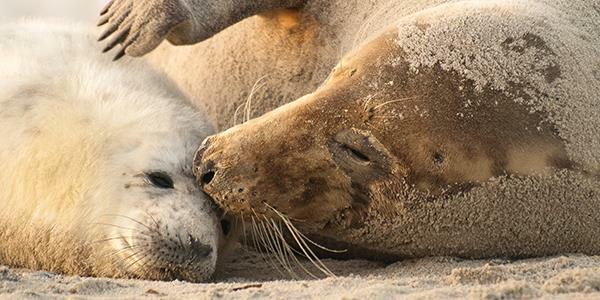 Blakeney is a National Nature Reserve cared for by the National Trust and more than 2,000 seal pups are born here annually, some of them even as late as January! The rangers keep a special eye on them, to make sure all is well during the mating season which, at Blakeney, is between October and January. During this time certain areas are fenced off for the safety of the animals and visitors. It is a lovely place to walk at all times of the year, so if you don't fancy a boat trip why not walk there and enjoy a wander amongst the sand dunes? Take a look at the National Trust website to find the four-mile coastal walk along the shingle spit to Blakeney Point. Or find out how to stay at nearby Barnham Broom by entering your details at the bottom.